And yet, despite this extraordinary success, a bill pushed in the New York City Council by the hotel industry threatens to undermine these core privacy protections, setting a dangerous precedent that undermines the trust and security that formed the basis for the Internet’s explosive growth. That bill-- Intro 981-- would blow a hole the size of a MAC truck through federal protections, forcing individuals who use platforms like Airbnb to disclose their private information to the government, all to protect the hotel industry’s record profits. This type of bill should send chills down the spine of any New Yorker who values his or her privacy online and believes that a free and open Internet requires a commitment to protecting sensitive, personal information. To start, if the government can force Airbnb to disclose the most precious information of their users without reproach, what’s to prevent it from forcing Google, Amazon, Ebay, a news publication, or any other website from doing the same? That may read as deeply Orwellian cynicism, but such a slippery slope is not entirely unprecedented. In fact, the City itself has just recently felt the threat of lost privacy, on the behalf of undocumented residents who fear the consequences of their personal information falling into the hands of immigration officials. 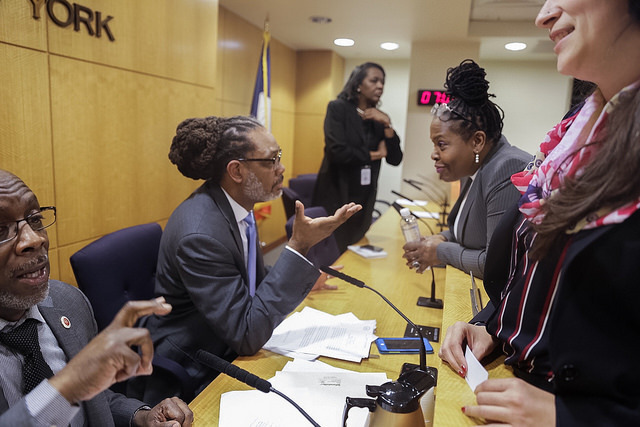 Those very concerns led the City to destroy potentially sensitive records gathered as part of its IDNYC program to ensure that they could not fall into other hands. The impact of lost privacy is also far from hypothetical for Airbnb hosts across the five boroughs, some of whom have already had their privacy violated at the hands of special investigators working for the hotel industry and New York City’s Office of Special Enforcement. That includes middle class home sharers like Skip in Sunset Park, who began sharing a portion of his family home when he developed medical issues that made it difficult to make ends meet. The extra income from opening his doors ensured he wouldn’t have to sell the home in which he was raised. In seeking to empower the very agency -- an agency that has worked hand in glove with a hotel industry set on destroying home sharing in New York, no matter what the cost for everyday New Yorkers -- that threatened Skip’s privacy with all hosts’ personal information, the City Council is making a clear statement on how it values the online security (not to mention, the economic stability) of regular New Yorkers. If Council members were concerned about more than protecting the record profits of an industry that donates hundreds of thousands of dollars to their campaigns, it wouldn’t be difficult to work together to find a way to share data to target truly bad actors, while cementing privacy protections that ensure the security of personal data online. Airbnb knows this better than anyone. After all, we’ve worked with cities across the country and around the world to achieve responsible regulation that provides government with the tools to enforce the law against bad actors while safeguarding the identities of regular, responsible hosts and the economic lifeline that home sharing represents for their families. We stand ready to do the same here in New York City. In the meantime, the need to protect and defend our privacy is as urgent and necessary as ever. As the battleground turns to the New York City Council, each of us must raise our voices and reject industry-backed efforts to sacrifice our privacy at the altar of profit. Andrew Kalloch is the Americas Policy Manager for Airbnb. On Twitter @AndrewKalloch and @Airbnb. Airbnb repeatedly allows and provides cover for commercial operators to break the law, turn our homes into hotels, and parachute into our communities to make a profit, pilfering apartments along the way. Instead of working with enforcement officials to curb illegal listings, the company uses every legal maneuver in the books—fighting subpoenas and refusing to share data—to take more and more housing out of our communities. Airbnb could easily disclose data on its listings. It does so in San Francisco, Chicago, New Orleans, and even China. But it refuses in New York. Why? Because it’s by far the company’s largest U.S. market, where it makes hundreds of millions more than any other U.S. city. It even goes as far as shielding unscrupulous commercial operators that evict tenants from rent-stabilized apartments just to protect its biggest money makers. And that’s on top of fueling gentrification and contributing to rising rents around the city as a result of stripping the long-term housing market of thousands of units. Again, that’s not sharing. That’s taking. And that’s why the New York City Council’s efforts to rein in an unaccountable, deceitful corporation by forcing Airbnb to disclose the addresses of its listings to enforcement officials needs to happen, and happen soon. Here’s the thing about Airbnb: the company thinks the rules don’t apply to it. In cities across the country and, in fact, across the globe, there has been a reckoning with communities and local governments passing sensible regulations to protect residents, only to see those laws ignored by a corporation that has built assets totaling more than $30 billion. And there are few cities that know this better than New York. In 2010, state lawmakers modified the 1929 Multiple Dwelling Law to ban short-term rentals in New York City apartment buildings for fewer than 30 days while the primary tenant is not present to ensure the “sharing economy” did not close the door to affordable housing on actual long-term tenants, or create quality-of-life issues in buildings not zoned for hotel and commercial activity. It was strengthened in 2016 to allow for more enforcement but Airbnb continues to throw up roadblocks. 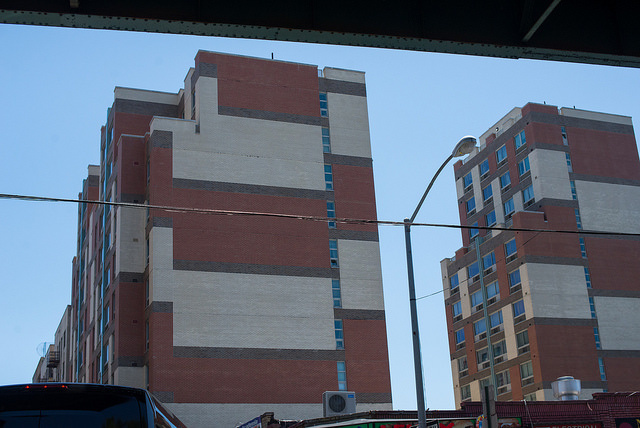 The company’s refusal to follow that law has allowed tens of thousands of illegal entire home/apartment listings to proliferate across the city in the midst of an affordable housing crisis when New Yorkers needed those apartments the most. Just last year alone, Airbnb generated $435 million in revenue from illegal listings in New York City, according to the School of Urban Planning at McGill University. That’s 435 million reasons why Airbnb cannot be trusted to police its own website, and why New York officials must step up, yet again, to pass additional regulations to stop Airbnb from breaking our laws. Like the stories we have heard in cities such as San Francisco, Boston, Washington, D.C., New Orleans, Chicago, Barcelona, Paris, Toronto, and Amsterdam, to name a few, the wealthiest among us have come to view Airbnb as a tool to make millions by turning homes into hotels and reducing available housing stock for everyone else. In New York, this has resulted in 13,500 units being removed from the housing market, according to the McGill report, making it even harder to find an available and affordable place to live. Make no mistake: despite the company’s best attempts to distract from the truth, the legislation being proposed by the New York City Council would have zero effect on the nice families in Airbnb’s commercials using the platform to make ends meet. Regular folks sharing their homes legally and responsibly are not the problem, and they are also not the norm when it comes to Airbnb. The millions of dollars the company invests in slick marketing and expensive lobbyists to peddle their ongoing misinformation campaigns does not change the fact its platform is overrun by unscrupulous landlords subverting our laws to make extra bucks at the expense of regular New Yorkers. Why should Airbnb be rewarded for having the track record of a greedy corporation that refuses to follow the law? In San Francisco, when Airbnb refused to police its site of illegal listings, the city enacted regulations forcing Airbnb to disclose the addresses of its listings, sending a strong message to bad actors and serial lawbreakers that they would no longer get a free pass to flout the law and profit from illegal activity. Almost immediately, Airbnb listings in San Francisco dropped by more than half and thousands of apartments returned to the long-term market for permanent residents. Now it’s New York’s turn. No corporation should get to pick and choose what laws it follows and what laws it breaks in order to make a profit on the backs of middle-class families. The New York City Council and Mayor de Blasio must see through Airbnb’s lies and deceit and act once and for all to protect tenants by swiftly passing legislation requiring Airbnb to share the addresses of its listings so enforcement officials can protect our communities and affordable housing. Tom Cayler is a member of the West Side Neighborhood Alliance in Manhattan. I don’t buy it, and neither should you. This is all just part of the hotel industry lobby’s smear campaign, funded by big corporate hotels, like Trump Hotels in New York City. Let’s walk through their mudslinging playbook one step at a time and then talk about the truth. Step one: Cite a “report” authored by a Canadian researcher and based on unreliable data and offensive racial profiling of hosts -- and most importantly, paid for by the hotel industry lobby -- and pass it off as serious academic research. Falsely claim that New Yorkers sharing their homes are responsible for gentrification. Step two: Demonize New Yorkers sharing their home so that they can afford to start a business, pay their bills -- and even combat those rising rent prices and stay in their home. Accuse these law-abiding people of gaming the system and operating in secret, and falsely claim that they are the single reason rents are increasing. And go for the shock and awe effect: compare them to President Trump (who, by the way, is a famous hotelier, for anyone looking to make accurate connections). Step three: Erroneously claim that Airbnb doesn’t share data about listings, hosts, and impact on the local economy. Paint Airbnb and home-sharers as a faceless, opaque, corporate special interest. Check, check, and check for the hotel lobby. Because in the case of home-sharing, the truth - the real truth - tells a different story. The truth is that increasing costs of rent, property taxes, and utilities are resulting in some New Yorkers, particularly in communities of color whose families have lived in their neighborhoods for generations, being pushed out of their homes. 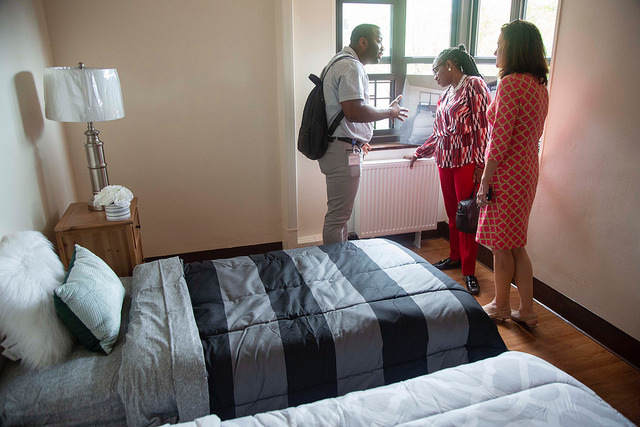 The truth is that, for these New Yorkers under increasing pressure to make ends meet, home-sharing platforms like Airbnb have been a tool of economic empowerment, especially in communities of color. It helps New Yorkers pay for that unexpected doctor’s bill, afford their taxes, fund a new business - and in the case of Airbnb, it’s even helped 79 percent of hosts to stay in their homes. The cost of living is not going down, but in the case of these New Yorkers, home-sharing has ensured that it doesn’t overtake them and their families. The truth is that home-sharing has helped New Yorkers take control of their economic future. With tourism booming, these new tools have helped expand economic opportunity to New Yorkers, not just hotel owners and others who have traditionally held the wealth and the power in our city. But here’s the most important truth: if any one party is to shoulder the blame for the declining affordability of our city, it’s the hotel industry that has that dubious honor. Next time the hotel industry blames New Yorkers for the affordable housing crisis, ask its representatives how many residential buildings will be converted into housing for visitors. Ask them what new hotel developments will include affordable housing. Ask them why they aren’t partnering with advocacy groups or the city to build new affordable housing. And most importantly, ask why the hotel industry is prosecuting ordinary New Yorkers just trying to make ends meet. Rev. Dr. Johnnie M. Green Jr. ios Senior Pastor, Mount Neboh Baptist Church and President of MPAC. I am a third generation Bedford-Stuyvesant resident, mother of three, and a proud constituent of City Council Member Robert Cornegy, Jr. For years, I’ve shared my home with travelers from all over the world -- introducing people to my favorite local businesses and generating some extra income to provide for my family. Hosting through Airbnb helps me pay my property taxes, contribute to my children’s education, and stay in the home and neighborhood I love, so that one day I can pass it on to my children. In his op-ed, McKee uses desperate attacks filled with debunked reports and misleading data to explain his misinformed view of why home sharing “doesn’t work.” He asserts that "75 percent of Airbnb revenue in New York City is generated by commercial hosts with multiple listings, not ‘regular folks’ renting their own place.” This is false. In reality, 95 percent of New York City hosts who share an entire space have a single listing and 88 percent of host ​earnings ​in ​the city ​come from ​guest ​stays ​in ​private ​and ​shared ​spaces (i.e. a spare bedroom), ​long-term ​stays ​lasting ​at ​least ​30 ​days, ​and short-term ​stays ​with ​hosts ​who ​have ​only ​one ​entire ​home ​listing. This data can easily be found in Airbnb’s monthly data releases, but it’s pretty clear that McKee has no use for facts. Indeed, he claims, without evidence, that "North and Central Brooklyn are the epicenter of gentrification in New York City, and Airbnb has played a destructive role.” Nothing could be further from the truth. In fact, Airbnb is helping families like mine stay in our communities. Home sharing is a bulwark against gentrification and the rising cost of living. Seventy-nine percent of Airbnb hosts in New York City report that home sharing has helped them stay in their homes, with 30 percent saying it’s helped them avoid eviction or foreclosure. Moreover, rents in many Brooklyn neighborhoods were rising far before Airbnb came to town. According to MNS monthly reports, the average 1-bedroom in Williamsburg in January 2011 -- when Airbnb was still in its infancy -- cost $2,979 a month. In October 2017, the figure was $2,946, a decrease over the period of Airbnb's greatest growth. The sad truth for a proud organization like Tenants PAC is that its leader, Mr. McKee, sounds more like a mouthpiece for the big hotel industry than he does an ally of tenants and homeowners. It’s outrageous for McKee, who lives in a pre-war condo in Chelsea, where two-bedroom units sell for over $1 million and one-bedrooms rent for more than $4,000, to point his finger at New Yorkers like me as the cause of gentrification in our own neighborhoods. It's even more ridiculous when he cites an offensive, completely flawed "study" by an opponent of home sharing that was torn apart by actual academics. Instead of parroting specious arguments made by the hotel industry, which continues to bulldoze permanent housing to build luxury hotels in New York City, even as profits stand at all-time highs, true advocates for tenants should get behind a bill introduced by Brooklyn Assemblymember Joe Lentol, A-7520, which would ensure that New Yorkers could share their own home, while protecting affordable housing from bad actors who threaten to remove permanent tenants. The bill creates a mandatory registration system for hosts and would allow Airbnb to collect nearly $100 million in lodging/sales taxes in the first year alone. That’s money that could be used for affordable housing, as in Portland, Oregon and New Orleans, or services for people without homes, as in Chicago and Los Angeles. You don’t have to look at Census data to realize that there are more white folks and fewer black folks here than there were 10 years ago. Bed-Stuy isn’t static -- no neighborhood ever is. But families like mine that have invested blood, sweat, and tears into this community for generations are going to do whatever we can -- including hosting through Airbnb -- to keep a toehold in the place we call home. Maybe Michael McKee should swing by sometime and see what we’re all about. Richelle Burnett is Airbnb host who lives in Bedford-Stuyvesant. City governments across the world are trying to adjust to and standardize their approaches to companies in the so-called sharing economy. With rapidly advancing technology, major financial investment, creative entrepreneurship, and little regard for the status quo, sharing economy companies -- such as Uber and Airbnb -- often catch government regulators unprepared and disrupt entrenched interests, leading to conflict. Government leaders are forced into difficult decisions, needing to balance embracing new economic opportunities, establishing the right regulatory framework, and protecting constituents. A growing number and variety of emerging platforms in recent years highlighted the necessity to adjust existing regulations, reevaluate security measures and benefits for consumers and workers, and outline partnership frameworks between government and platform providers. 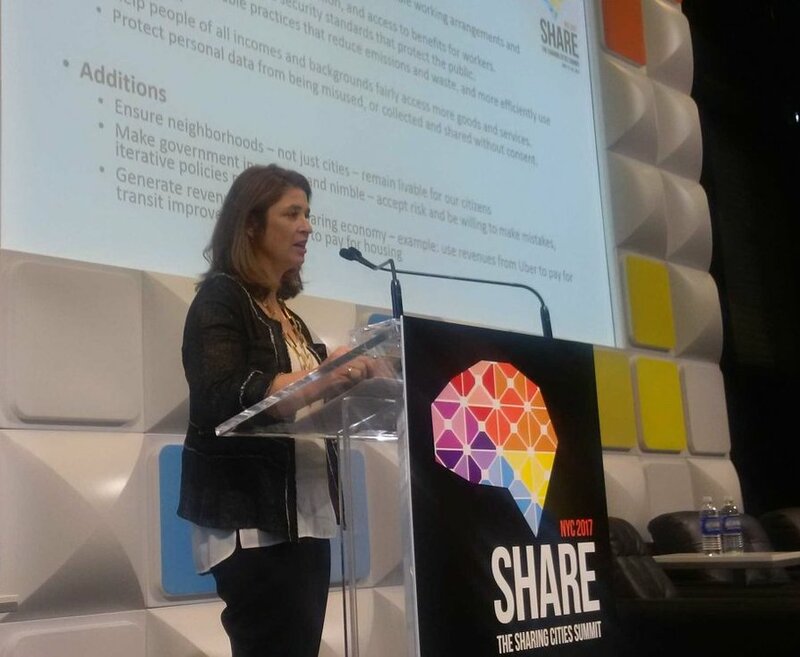 Software companies, government representatives, and gig economy experts gathered in mid-May in New York City for the 2017 Sharing Cities Summit -- “embracing and shaping the sharing economy” -- hosted by New York City Deputy Mayor Alicia Glen. Partially closed to the media, the gathering was framed as an opportunity for participants to discuss issues related to adapting to and embracing the sharing economy, in part through sharing experiences, and to come up with a set of guiding principles for cooperation. The summit, which mostly took place over three days at the New Lab in the Brooklyn Navy Yard, addressed three key topics: “data collection and policymaking,” “consumer protection,” and “worker protection.” Its opening and closing sessions, which featured remarks by Deputy Mayor Glen, Amsterdam Deputy Mayor Kajsa Ollongren, an introduction to the topic by gig economy expert Arun Sundararajan, and others, were open to the media. “I think that we need a common framework...to shape our approaches beyond just reacting to a single company, or even a sector,” said Glen, who oversees housing and economic development for Mayor Bill de Blasio. “Working together we can expand our own knowledge of this transformation and send a very clear signal to the companies about what our expectations are.” For the sharing economy platforms, it would mean more predictability and less political risk when expanding to different cities and countries, she added. “Crowd-based capitalism”, another term for the sharing economy concept, is an emerging form of economic activity that will be “increasingly dominant” in the coming years and will overturn, at least in part, the “20th century industrial capitalism as a way of conducting business”, explained Sundararajan, who is a professor at the NYU Stern School of Business and author of the book “Sharing Economy.” This new economic model connects various service providers, or even a collective of individual service providers, to various consumers as opposed to established institutions with many employees supplying a product to customers, it has new intermediaries and shifts the basis of consumer trust. As one of the industry experts, Sundararajan gave a 20-minute overview of the concept and moderated a panel consisting of four sharing economy platform providers: Lyft, Postmates, Managed by Q, and Getaround, at the summit kick-off dinner. Transportation and accommodations have become essential pieces of the “sharing economy,” which is often noted as a misnomer, given that money is typically exchanged. Other sectors include professional services, like consulting, and areas within the food sector. The sharing economy will affect the energy sector as well, Sundararajan added, explaining that as the batteries that preserve solar power improve, people will start accessing and redistributing energy locally, instead of sending it back to the grid. This may lead to new regulatory challenges for the energy sector in the future. The sharing economy is blurring the lines between casual labour and professional work and changing the significance of what it means to have a job, Sundararajan said. But despite opportunities emerging thanks to the popularity of sharing economy platforms, there are downsides. For example, sometimes freelance workers have to deal with wage theft and misclassification by employers trying to avoid legal fees. In the light of this trend, Deputy Mayor Glen highlighted the importance of further developing the concept of “portable benefits.” Now, when more and more people are tiling together their career mosaic, there is a necessity to “level the playing field” for them and find a way to provide adequate healthcare, pension, and other benefits, according to Glen. “The employment model that built economic security for many during the 20th century— often a unionized job that provided a pension, health benefits, Social Security, workers’ compensation, and unemployment insurance—has become increasingly out of reach,” a report published by the Roosevelt Institute indicates. Its authors, Rebecca Smith, Deputy Director of National Employment Law project, and Nell Abernathy, Vice President for Research and Policy at Roosevelt Institute, --- the latter participated on a summit panel -- identify three key measures to address the issue: “expand the public safety net, support new models of negotiated benefits, and ensure business and public funds supplement the contributions of workers and consumers.” The report was included in the list of references for summit participants, and also reviews possible funding options for portable benefits, such as public money, user fees, business and worker contributions. Glen, whose administration waged a losing battle against Uber in 2015, offered a few examples of situations in which the workers and the consumers may need protection. For example, ensuring that workers are compensated fairly. Here, for instance, she gave “positive credit” to TaskRabbit for removing a system of bidding on tasks from its platform and sticking to fixed hourly rates, because it helps prevent users from bidding themselves down, she mentioned. Another priority is to ensure both quality of service and safety for consumers. Considerations must be given to workers’ hours and benefits, liability and insurance, on-time payment, and more. The gig economy creates a vast amount of new data. “We’ve got this digital interface that is going to be be sitting between us and the things that we get,” Sundararajan said. Consequently, there is a need to figure out what to do with this data, how to regulate it and protect consumers, how the government should use it and collaborate with platforms to access it. There are a few examples of how data exchange between sharing economy platforms and government could help improve citizen experience. For instance, in the beginning of 2017, New York City mandated Uber, Lyft and other for-hire car services share data on where drivers pick up and drop off passengers. Understanding how people move could potentially help the government improve the city’s transportation system, by identifying congested zones that are lacking enough public transport options, for example. This information will be in addition to other data already collected by the city. Another example is cooperation between the government of New Orleans and Airbnb that includes data sharing. The company supplies to the city the names and addresses of hosts. Airbnb came under fire in New York, where its ability to operate as it had been received a major blow through new state law cracking down on those posting illegal apartment rentals. In light of the recent global cyber attack, protecting and regulating consumer data was also a topic highlighted repeatedly during the Sharing Cities Summit. The forum served as the grounds for launching the Sharing Cities Alliance, an independent association headquartered in Amsterdam, that aims to bring together city leaders and sharing economy participants to exchange knowledge and data in the hopes of creating some shared principles and, possibly, regulatory frameworks. The five founding cities of the alliance are New York City, Amsterdam, Toronto, Copenhagen, and Seoul, according to a Twitter post by Deputy Mayor Glen. Seoul was dubbed the world’s first “sharing city” by the alliance, thanks to the efforts of Mayor Park Won-soon and Seoul’s Metropolitan Government that launched the Sharing City Seoul initiative in 2012. The Sharing Cities effort, as described on the website of the Alliance, includes a few milestones in its brief history. One is the Sharing Cities resolution signed by the United States Conference of Mayors in 2013 that promotes “better understanding of the Sharing Economy” and encourages creation of local task forces to establish regulations. Another is the launch of Amsterdam Sharing City in 2015. 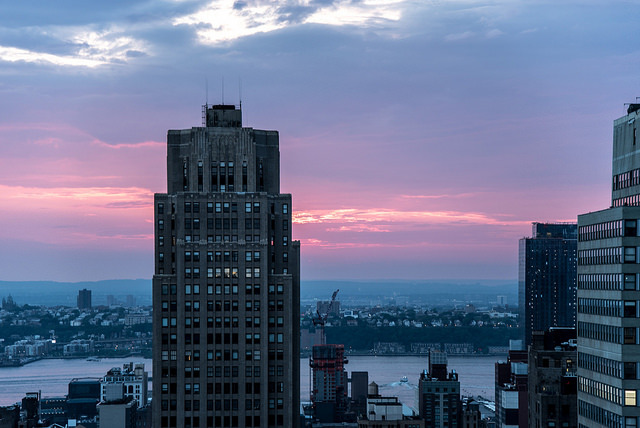 The giant tech unicorn is looking for an encore in New York as it faces a sharp curtailing of business in the state, especially New York City, if Governor Andrew Cuomo signs a bill that imposes significant penalties on listings of illegal hotels. Airbnb has put out an avalanche of advertising in Albany and New York City along with pressure from big names like Peter Thiel and Ashton Kutcher, both of whom are early investors in the company. The narrative, risible to all but the uninitiated, suggests that the ill-intentioned hotel industry is behind the legislation that would boot hundreds of middle class families from their homes on account of their inability to meet mortgage payments without income from renting out their “spare” rooms. 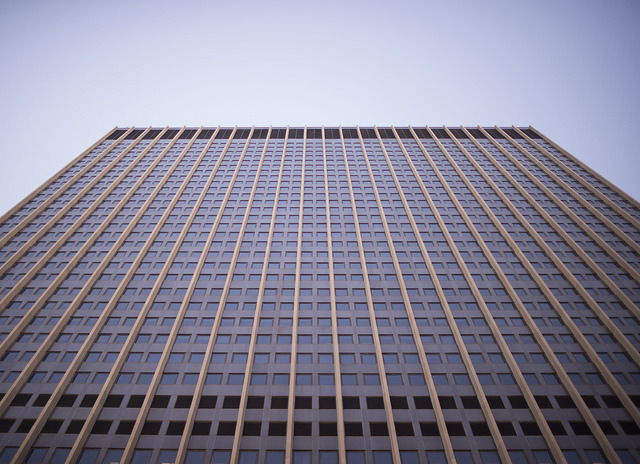 In fact, entire apartments, floors, and buildings without any of the mandated attributes of hotels, such as access for the disabled or fire-protection safeguards, are being converted to illegal hotels. There are good, important reasons that hotels are regulated as they are and pay the taxes that they pay. That so many illegal Airbnb hotels are in the city center area shows as a lie that the company’s business model is reviving the outer boroughs. A glaring inequity is that real estate and income tax subsidies meant to spur homeownership are being used to gain an unfair competitive advantage over hotels. Unsurprisingly, in New York City a good deal of the illegal transient occupancy growth has occurred in rent-regulated buildings with many beneficiaries of rent regulations quickly snapping up the online arbitrage opportunity by extracting market value for their "ownership" of prime real estate. An oft-repeated bromide of Airbnb points to their model allowing for better utilization of resources by using homes as hotels. Perhaps. But why not then use dining rooms at homes as restaurants and bars, and conference rooms in offices as banqueting halls? Why not allow private pilots to take on paying passengers in empty seats? The answer is obvious except to those who deliberately refuse to acknowledge it. Airbnb’s New York City “inventory” now exceeds 20 percent of the total number of hotel rooms. That only underscores the fact that a majority of their rentals are illegal. That the transient lodging industry employs over 50,000 people in New York City alone and has been a pillar of stability during the Great Recession ought to put the “debate” about Airbnb’s spurious claims to societal benefits to rest. But a model where success is predicated on illegality will stop at nothing to ensure its continuity. With the signing of new regulations by Governor Cuomo, order will be restored to what is now a dangerous, abusive industry that is out of control. Vijay Dandapani is Chair of the Hotel Association of New York City. On Twitter @dandipanivijay. Airbnb is now entering into the fray a new study, previewed by Gotham Gazette and to be released Friday, called “How Airbnb Can Support Low-Income Communities in NYC,” which indicates that New Yorkers in low-income neighborhoods are able to supplement their earnings in important ways as Airbnb hosts. The report finds that Airbnb listings from low-income neighborhoods in the South Bronx, Harlem, and North-Central Brooklyn are growing at a faster rate than in the city as a whole, and that Airbnb income in these areas equates to nearly half the amount of aggregate public assistance cash directed to residents (not including non-cash support like food stamps). Company data shows “significant demand for accommodation in these neighborhoods and that home sharing is already a critical lifeline” for many residents. The report comes as some city and state elected officials, aligned with affordable housing advocates and the major hotel workers union, organize in efforts to convince Gov. Cuomo to sign the bill that would greatly limit advertising of Airbnb rentals in New York City and argue that Airbnb rentals harm low-income New Yorkers by contributing to housing scarcity. The legislation passed by the Legislature in June (A8704-C/S6340-A) would make it illegal to advertise entire home or entire apartmentment rentals for fewer than 30 days—a type of rental that comprises the majority of Airbnb listings in the city. Airbnb representatives and supporters, including some elected officials, have called the bill an overreach, crippling to an essential element of the modern “sharing economy,” and the product of undue influence by special interests, like the hotel workers union. Such short-term renting arrangements have been illegal under New York City’s multiple dwelling law since 2010, but advertising them remains legal. If the proposed bill is signed by Cuomo, posting an entire home renting arrangement for under 30 days on Airbnb could warrant a $1,000 fine for first-time offenders and up to $7,500 by the third violation. The governor has said he’s reviewing the legislation, but he has not taken a definitive position, so lobbying from both sides continues. Anti-Airbnb efforts are being led by the “Share Better” coalition - the group has received funding from the New York Hotel and Trades Council, which represents hospitality workers who stand to gain from a more favorable climate for hotels. Efforts are being run by executives from Metropolitan Public Strategies who have connections to HTC. One key issue for the anti-Airbnb effort and the bill before the governor is how much public pressure to put on Cuomo to sign the bill. Those in favor of the bill argue that commercial operators abuse Airbnb to make millions from illegal short-term listings, citing a 2014 report by State Attorney General Eric Schneiderman that identified 72 percent of Airbnb listings in the city as being in violation of the city’s multiple dwelling law. 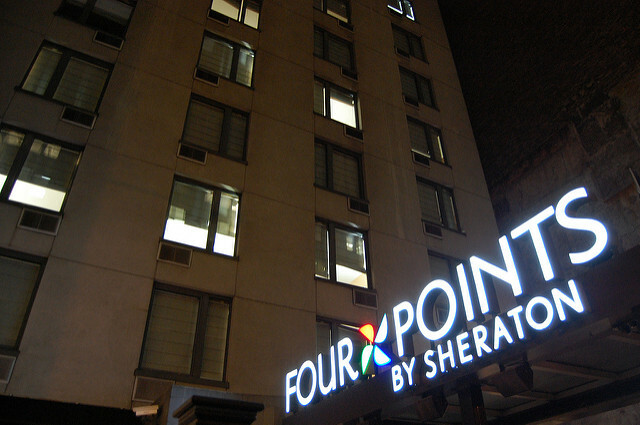 In essence, the argument is that New Yorkers have been running illegal hotels. While the AG’s report uses data from 2010 through 2014, which Airbnb calls significantly outdated, proponents of greater regulation say the illegal listings have grown since and have a negative impact on the city housing market, including much-needed affordable housing. 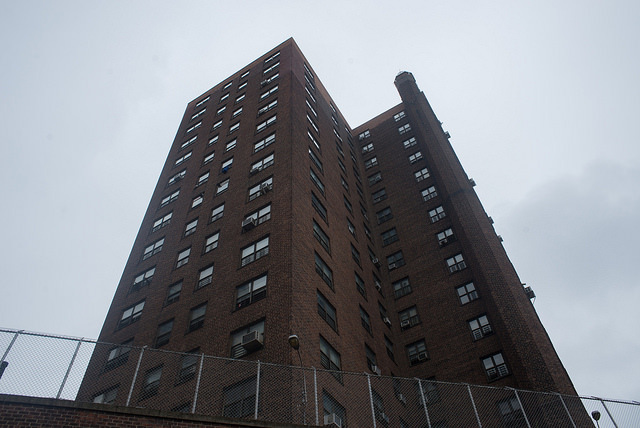 In July, 15 members of the New York City Council’s Progressive Caucus sent a letter to Cuomo, calling for “stopping the proliferation of illegal hotels that currently puts affordable housing at risk.” A spokesperson for the Caucus told Gotham Gazette that “a similar cohort” of Caucus members are involved in additional organizing efforts, which are said to include a broader group of officials. Council Member Helen Rosenthal, a Manhattan Democrat who is part of the Progressive Caucus and has been a leading voice calling for further regulation of Airbnb, told Gotham Gazette that she wants Cuomo to sign the bill primarily to stop Airbnb from skirting the existing regulations. Rosenthal added that she and other legislators have worked with housing advocates and Share Better, who all say entire-home renting is contributing to a citywide housing shortage, citing 8,000 units that would otherwise be on the rental market. Share Better and Metropolitan Public Strategies, a consulting and communications firm, have coordinated to publicize hotel and housing special-interest groups’ opposition to Airbnb, with the firm's Executive VP Austin Shafran acting as a spokesperson for Share Better. In the past, Metropolitan Public Strategies' CEO Neal Kwatra has served as a director for the Hotel Trades Council and as Chief of Staff to Attorney General Schneiderman before founding the firm in 2014. In recent months both organizations have written talking points for City Council members. Rosenthal has drawn on Share Better points and worked with the coalition on an op-ed against Airbnb. "Share Better and I work together because we align on protecting affordable housing. I appreciate depth of data analysis and research they bring to the table," Rosenthal told Gotham Gazette. Share Better also organized a campaign at the Democratic National Convention, trying to influence the public debate around regulating Airbnb, which, like other aspects the "new" economy and disruptive "innovations" like charter schools, has divided Democrats. Airbnb warns further regulation will do more to harm homeowners than protect them, according to Schottenfels, who added that the company has already removed over 2,200 listings that it believes could affect the permanent housing market. Now, the new report from Airbnb seems to echo a key argument that was made by Uber in its fight to fend off New York City regulations of its car-hailing service: that low-income New Yorkers, especially people of color, are benefiting from its existence. The report focuses on certain low-income communities in Harlem, Brooklyn, and the Bronx referred to as “revitalization areas”—which generate about 10 percent of total Airbnb income in the city—and highlights that revitalization area residents can increase their household income by renting out their home for three nights per month, on average. For his part, Gov. Cuomo has not yet indicated whether he intends to sign the bill. When reached for comment, a spokesperson for the governor told Gotham Gazette that the bill “remains under review by Counsel's office." The bill has not yet been sent to Cuomo’s desk. The Governor has until January to sign all bills passed in this year’s legislative session, but once he requests a bill from the Legislature, he has 30 days to sign it, veto it, or let it die by pocket veto. Note: this article has been updated with additional comment from Council Member Rosenthal and clarification on her collaboration with Share Better. Lawmakers in Albany and New York City began an assault on Airbnb with a 2010 bill that placed arbitrary time limits on short-term rentals. This year they doubled down, passing an anti-innovation bill, shoved through at the eleventh hour, that goes even further. It slams users with hefty fines for advertising Airbnb-style rentals. Not only that, but the bill’s loose language has left the door wide open for Airbnb, and its closest competitor Homeaway, to be directly hit with penalties. A violation of federal law. Airbnb helped 400,000 visitors bring $632 million to New York City in just one year, spanning parts of 2012 and 2013. What’s more, 25,000 New Yorkers use Airbnb to help cope with the city’s high cost of living by earning income from extra rooms. The value to hosts totaled an impressive $420-$500 million last year, according to AirDNA and American Action Forum figures. These numbers clearly show Airbnb is a boon to New York City. So why does Ashton Kutcher have to beg the very politicians whose constituents are benefitting from this service to not kill the industry? Because a narrow group of special interests, like the hotel industry and their workers, are entrenched in Albany and City Hall. They are throwing everything in the kitchen sink at Airbnb, with little concern for the facts or consequences if New York loses half a billion dollars in economic activity. That’s why New Yorkers are hearing scare tactics like false claims that “virtual hotels” are wreaking havoc on housing costs. New York City Public Advocate Letitia James actually said that Airbnb is “precipitating a spike in homelessness, unprecedented since the Great Depression.” Really? You’d need a microscope to see that impact. And you’d need to be living in an alternate reality to think it’s increasing housing costs. That’s not the only time the Airbnb opposition has ignored the facts. The Attorney General’s office found an overwhelming 94 percent of Airbnb users are not posting ads for more than two units. Another sign there is no real problem – unless you view a business innovating with a new service as a crisis. Shielding an industry from competition should never be the goal of policymakers. That said, there may not be much reason for the hotel industry to panic. Additionally, the City saw a record 60 million visitors last year. This suggests Airbnb is combining with hotels to give travelers more options. Plus, home-sharing is actually spreading that economic activity to the outer boroughs. Clearly, the data provides little support for outrage over Airbnb, let alone trying to undermine the business. Yet, the opposition’s risky offensive is not interested in careful consideration. The bill they rushed through is all the evidence you need. It exposes companies to fines that would violate federal law if imposed. In 1996, Congress saw that e-commerce was too important to be subject to the whims of state legislatures. That’s why Section 230 of the Communications Decency Act protects sites like Airbnb from being sued, or from shut down by state and local governments over users’ actions. This statute continues to protect Internet entrepreneurs from litigation. It has allowed the creation of YouTube, Facebook, and many user-generated services we enjoy. Simply put, the legislature’s reckless fines go too far for federal law. Still, New Yorkers deserve better than hoping the feds, or the Governor’s veto, will save them from their own misguided, and clearly compromised state legislators. People need to learn more about this outrageous attack on innovation, and hold lawmakers accountable. We can do better than leaving it to Ashton Kutcher to protect our economic future. Brandon Muir is executive director of Reclaim New York; Evan Swarztrauber is communications director for Tech Freedom. On Twitter @ReclaimNewYork and @TechFreedom.